Stewart House Fundraising Activities. Help us support children in need. 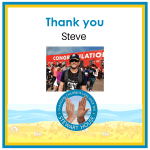 Whether you participate in a marathon, cycling challenge, swim, reading challenge, or use your wedding, birthday or anniversary, there are many ways that youcan raise money for Stewart House. You can create an online events page through Everyday hero or send the proceeds directly to us through an online donation. If you are planning major fundraising events, please contact us at marketing@stewarthouse.org.au for your authority to fundraise on our behalf. We may also be able to assist you with marketing materials. Visit us in person: Stewart House is a big site and has many street frontages. Visitors must come to our Batho Street building at the very top of the site. Our address is corner Batho Street and Wyadra Avenue, Freshwater, NSW 2096. Follow the signs to the office. 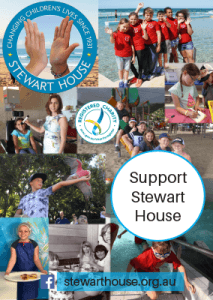 Stewart House is a registered Australian charity with DGR status. All donations over $2 are tax deductible. Once your donation is processed we will send you a tax receipt to the email address provided. 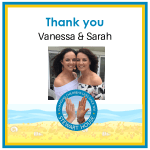 Thank you to Vanessa and Sarah who raised $3,300 for Stewart House through online fundraising for their 40th birthday celebration. This included 23 donations from generous family and friends through Everyday Hero. Thank you! Thank you to all those individuals who participated in the City to Surf in support of Stewart House! A mammoth achievement all in the name of a great cause. A special shout out to Steve Bond, who has been running in support of Stewart House for the past 6 years and this year raised over $1,600. Thank you Steve!